Please join us on our club’s 8th annual drive out to Starved Rock State Park on Sunday October 24th. Enjoy a scenic all day ride on some fun back roads, a group lunch and a chance to witness the fall colors at a very cool state park!! WHEN: Sunday October 24th. Drivers meeting at 9:15 and departure at 9:30. WHERE: Start is in the parking lot at the SouthEast corner of Golf Road and Barrington Road in Hoffman Estates. 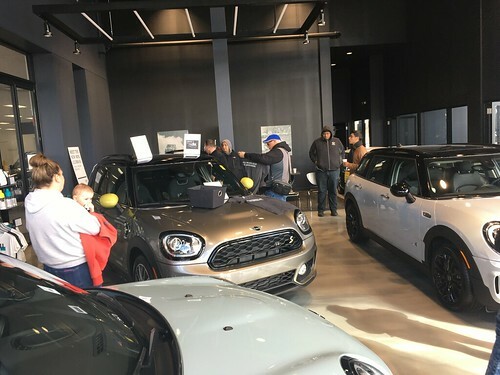 WHO: This event is open to all members, potential members, and friends of the Chicago MINI Motoring Club!! WHAT: An all day drive to explore fun roads, hang around with MINI friends, and visit Starved Rock State Park. WHAT TO BRING: A full tank of gas, appropriate clothing for the weather outside, a camera, lunch money, optional FRS radio for in-car communication tuned to Channel#1 SubChannel #1, and a smile. IMPORTANT: Please RSVP by adding a comment to this post. We need a good count of people for our lunch reservations!! Will join you for lunch, won’t be able to go to Starved Rock, another family affair. I’ll be there.. Looking forward to it!! We are planning on driving at least till lunch. Have another obligation later in the afternoon. Sadly we’ll probably be out of town and unable to make it. Quite bummed; we love this one! Sounds great! — do we have a route yet? I have a friend who’d like to join us somewhere between HoffmanEstates and Morris; is that possible? Sounds fun – we’ll be there! Me and Michelle will be there! I will be coming and bringing a couple of friends along. Looking forward to the drive. We’re in if the rain clears up for Sunday. I will try to make it and bring some friends too! See you all on Sunday! If you are coming from the east it is probably easiest to turn into the parking lot from the Barrington Road side about 1/4 block south of the intersection. I have relatives in Utica I really need to visit. What time is lunch in Morris? Is there a route map to be found to jump in along the way? To leave from downtown to go north to go Southwest seems silly, especially if the weather is questionable. I am sorry I will miss this – I am leaving that day for a conference. Hope to meet everyone next event. HAVE A GREAT TIME!! My wife and I will be there…looking forward to it. We’ll be there with 3 for lunch. I’ll Be there… If the weather stays nice, I’ll be there for lunch as well. Might have another MINI in follow, but they won’t be staying for lunch! Newbi with a Mini. I would love to join you on your motoring trip as I just got a new R56 2010 and I love it! See you there. (1) Thanks. Conrats on the new MINI and glad you’ll be able to make it Julius!! Paula and I will be there as well. Count me in….so that’s one more mini and two people. Sorry, will have to miss this one, have a great ride. Hi guys I just bought a R55, JCW last Sat found you sat morning thought I would love to meet other fun loving mini owners. I hope it’s ok will try be at the lunch stop. We are from champaign so about 100 miles for us to meet up for lunch. Thought the drive up for Starved rock would be so nice and to meet fellow mini owners sounds like a twofer. Nice ride, and we even got some sun — thanks, Steve! Fun day today!! Huge thanks to all who participated, including all the new people on their first club drive. Thanks to steve and route planner, nice ride ,good food , great company. Thanks to Steve and all the wonderful people we met was a wonderful drive cool roads fun drive. I apologize for being abrupt to some people bothering my Service Dog but she has a Job to do and needs to be left alone by people an pets no need to pet, touch or sniff bothered. She has been attacked twice by people’s pets and has no desire to be bothered.